Cats are notorious homebodies, loving nothing more than finding a sun-warmed spot somewhere in your home where they can stretch out and enjoy a nap. Their largely relaxed, nonchalant attitude means that they are rarely bothered when you leave, so long as you don’t make them go with you! Nevertheless, there are occasions when it may be essential for your feline friend to leave your property – such as trips to the veterinarian, groomer or boarding facility. While many cats are less than impressed with travelling, there are some things that you can do to make the event less stressful and more tolerable for both you and your furbaby. For safety reasons, a carrier is essential for any journeys that you may need to make with your pet. Not only does a carrier create a much smaller space for her to bounce around in in the unfortunate event of an accident, but it also prevents her from climbing around and distracting you when you should have your full attention on the road. Carrier or crate-training your cat should be a priority for any pet owner. This is because a carrier can provide a safe, private space where your cat can spend time if she feels overwhelmed or anxious. The positive associations associated with her carrier or crate can then be extremely useful in reducing any anxiety your feline furbaby has about travelling, as she will be travelling in her a space she feels is safe and secure. Although your cat will be travelling in the safety and comfort of a carrier, it may still help her to get acquainted with the sights, sounds and smells of your vehicle. Park up with the engine running and gently place your kitty inside. Let her sniff and lick and explore the interior of your car for a few minutes, which will help reduce her anxiety about her carrier being place in unfamiliar territory. As aloof as your cat may appear, we guarantee she will not be averse to the odd treat. Once she has had been inside your car to look around, reward her with some praise and affection, and maybe one of her favorite treats. Continue with rewards every time you need to take a trip, and it will soon be a much more pleasant experience for your kitty. Gradual exposure is one of the best ways to get your pet acclimatized to new and disconcerting situations. 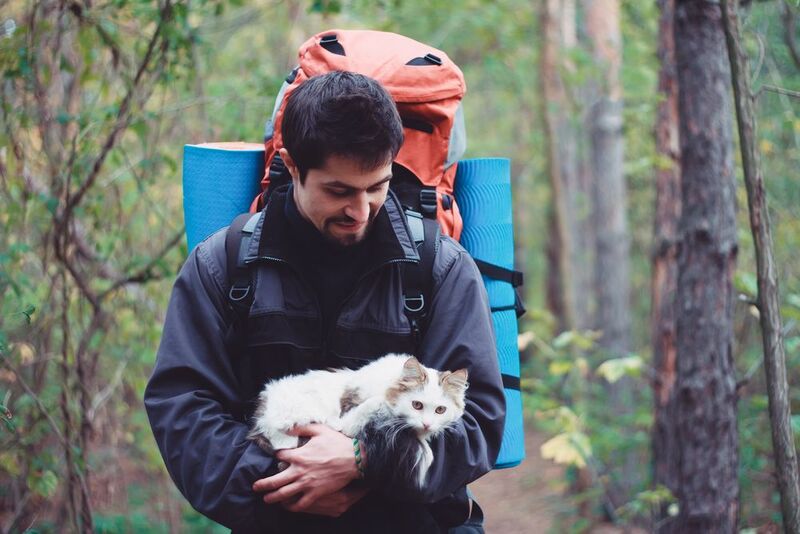 If the first planned trip out with your cat isn’t exceptionally short, try and get her used to the sounds, smells and sensations of travelling by slipping in some mini-trips first. Begin with a trip around the block, and then build up to journeying further afield. If an occasion arises whereby you need to take an extended journey with your cat, you will need to ensure that you factor in comfort stops for her as well as for you. Let her out of her carrier periodically so she can stretch her legs, and drink some water. Don’t forget to take a litter tray that she can use. However, ensure that all of her rest break takes place inside a secured car, unless she is attached to a harness or leash. For more information and advice on how to understand your furbabies, contact and make an appointment with our veterinarians.